Oh yes you heard me right, a Hot Chocolate Cocktail recipe! Now that it's freezing outside I automatically go into wrap up warm, blanket, sofa, movie and hot chocolate mode and hurrying up December so I can get into the full Christmas spirit. I've also been seeing Irish Cream liquor up and down the shopping aisle which I loooove! It screams Christmas time to me as weirdly enough I never have it at any time of the year. So what could possibly be better than a hot chocolate and Irish cream liquor cocktail? Err nothing! Except maybe a side of cream and marshmallows! Here's my super simple hot chocolate cocktail the ingredients is for one large mug of hot chocolate. Gently heat the milk in a pan, as the milk begins to simmer whisk in the Nutella until dissolved. Then add the Irish cream liquor. Cool for a minute and pour into your favorite mug. Top with cream and marshmallows and dust with coco powder. 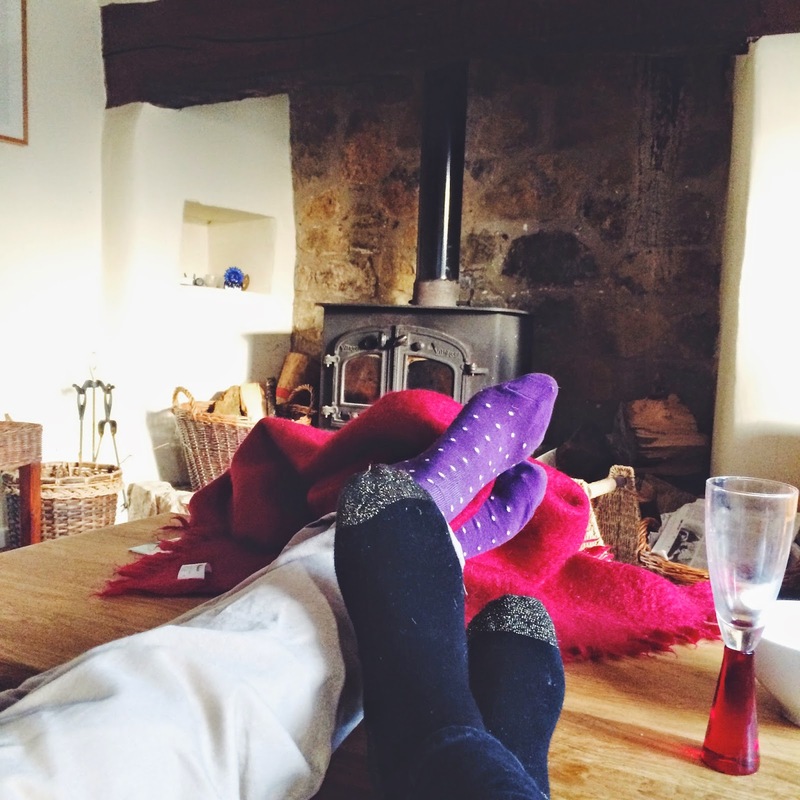 Grab a spoon, light some candles and go get cosy of the sofa. Enjoy! That morning when I first tried on the tights I loved how incredible soft they were. They were tight and very supportive around my thighs, bum and hips (no muffin tops) but comfortable. They were quite long so I had to wear pulled up quite high on my stomach, the waist band has a scalloped edge which was really comfortable, although I did wonder if it would roll down throughout the day or become uncomfortable but for now they felt very comfortable, warm and slimming. I set off for a busy day Christmas shopping, they still felt comfortable, the waistband didn't roll down as I feared and I didn't once have to pull them up to prevent Nora Batty ankles. So far so good! Once we were all shopped out we headed home, usually by then I normally couldn't wait to get out of my tights but I didn't feel the need in the Playtex 24h soft tights. I did however have to swap my dress for a more comfy jumper dress. 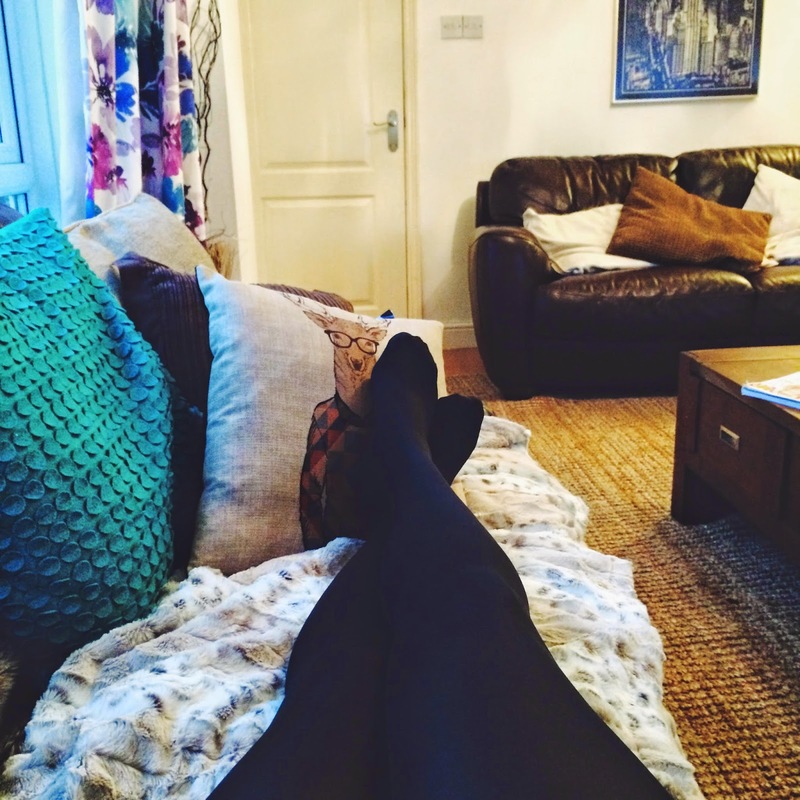 I carried on my day, playing with the little lads, sitting watching TV and cooking, all the while feeling perfectly comfortable although truth be told I would normally have changed into lounging trousers but for the purpose of this challenge I didn't. I finally took the tights off at 9pm to change into my PJs for the night, I can honestly say the 24hr soft tights are very comfortable. I never once had to yank them up, they felt supportive the entire time I was wearing them without being restrictive and yes they felt soft and warm. I can't imagine when I would ever need to wear a pair of tights for 24 hours straight but the Playtex 24H Soft tights can definitely see me from day to night whilst out and about but I will always choose to change into lounging trousers when I get home no matter how comfortable the tights are, that's just me. In the Playtex hosiery range they also have tights 1 Size Down (suppose to make you drop a dress size after a week of wearing them) and the Expert in Silhouette (for flattering tums, lifting bums and slimming thighs- wow!) I will be saving these bad boys for the work Christmas Party my sister has kindly invited me to, I can't wait! I will let you know how I get on. 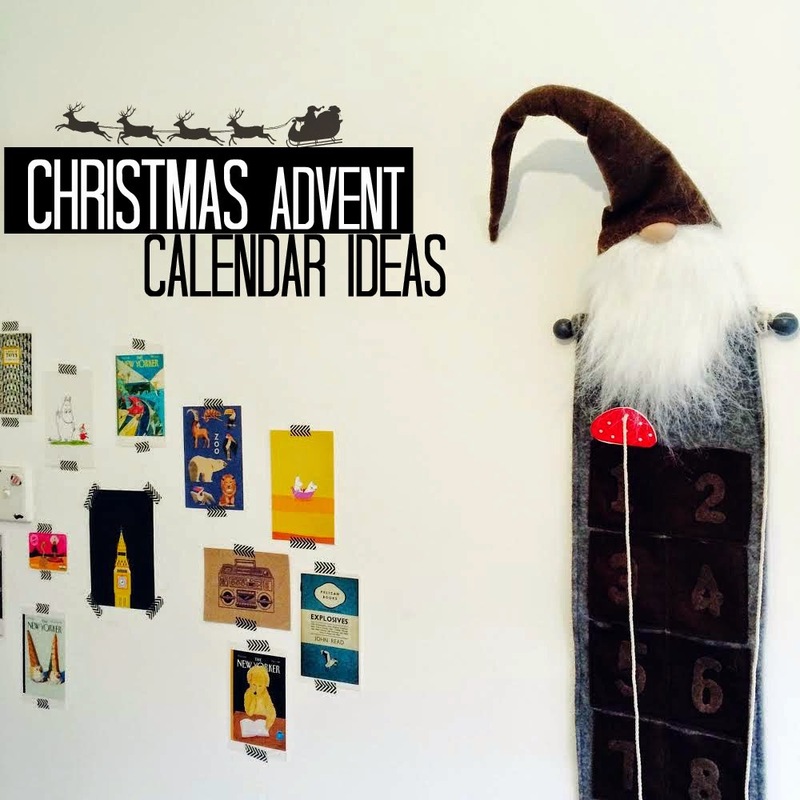 This year I wanted to try a different type of Christmas Advent Calendar, an Advent Calendar where I can choose the gifts the little lads receive each day on the count down to Christmas! I found this adorable Christmas Advent Calendar in Homesense for only £12.99 it's so well made that I'm hoping it lasts for years and years becoming one of our Christmas traditions. Now I have the Advent Calendar what Christmas gifts to fill it with? I've decided to do a mix of sweetie treats, small toys and Christmas activities/days out. Gifts - You could shop around for small pocket sized toys or you could just shop at Hawkins Baazar, they have a 'Pocket Money' section which is full of small cheap toys. I've chosen a few of my favorites below, prices vary from 35p - £3. If you don't fancy small toys how about little Christmas tree decorations your little ones can hang on the tree, special baubles that are different from all the rest. 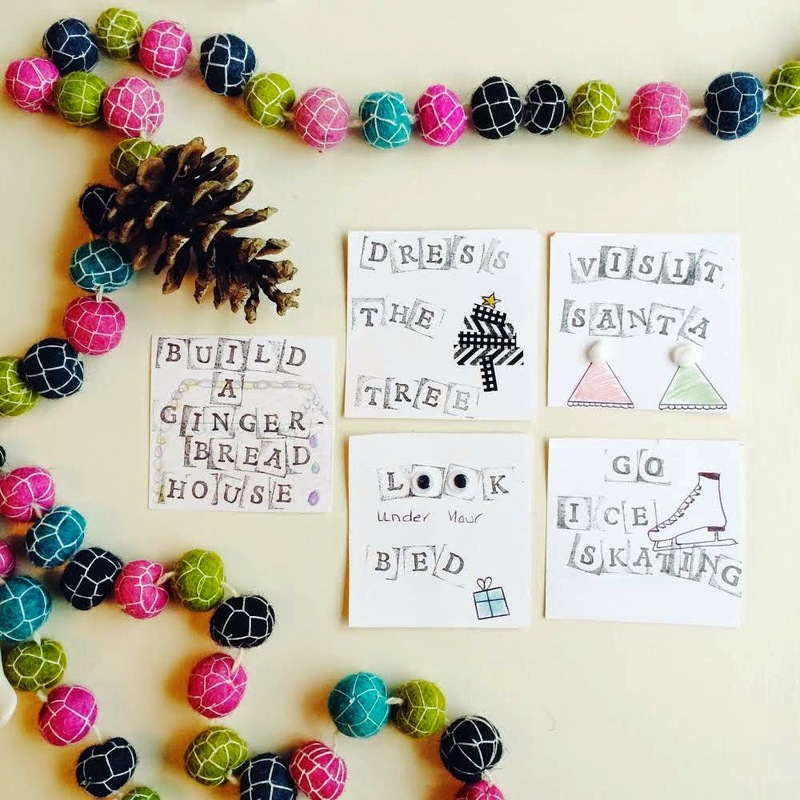 Christmas Activities/Days Out - This is a great way to get organised with Christmas Activities or Days Out throughout December. 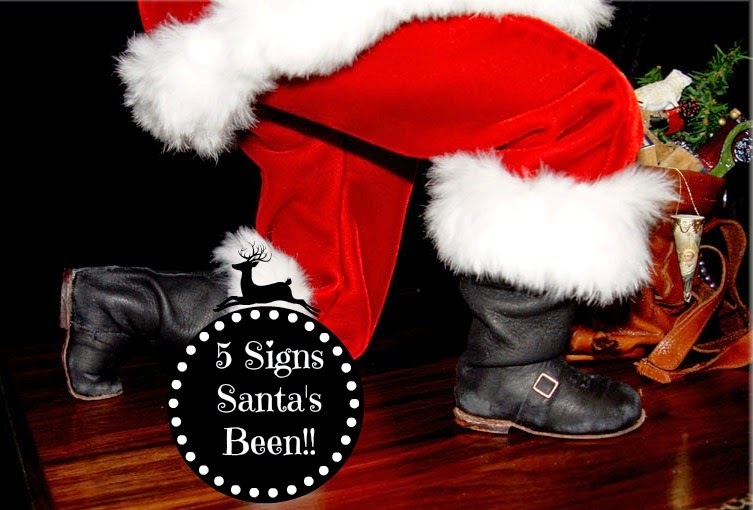 I will slip a homemade Christmas activity card and chocolate coin in the pockets "Make a Gingerbread house or Visit Santa" then fill the day around it and on the 24th make a card saying "Check under your bed" you can then pop the Christmas Eve Present/Box there for them to find. I think this is a lovely way to build up to the main event! Christmas is coming! whoop! whoop! 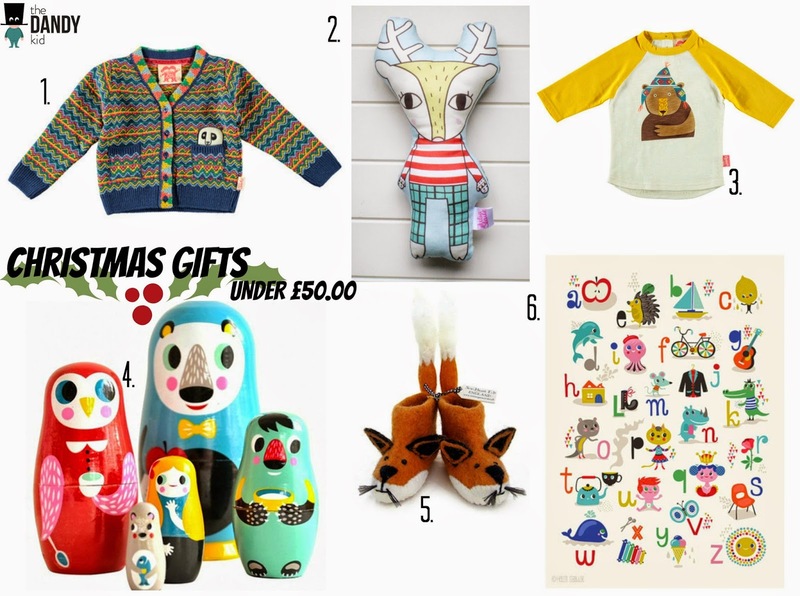 and I have put together a lovely Christmas gift idea list for your little lads or lasses from The Dandy Kid which was more difficult than you would expect, there is just so much loveliness to choose from, I want it ALL! Seriously how beautiful is the Tootsa Macginty Cardigan?! 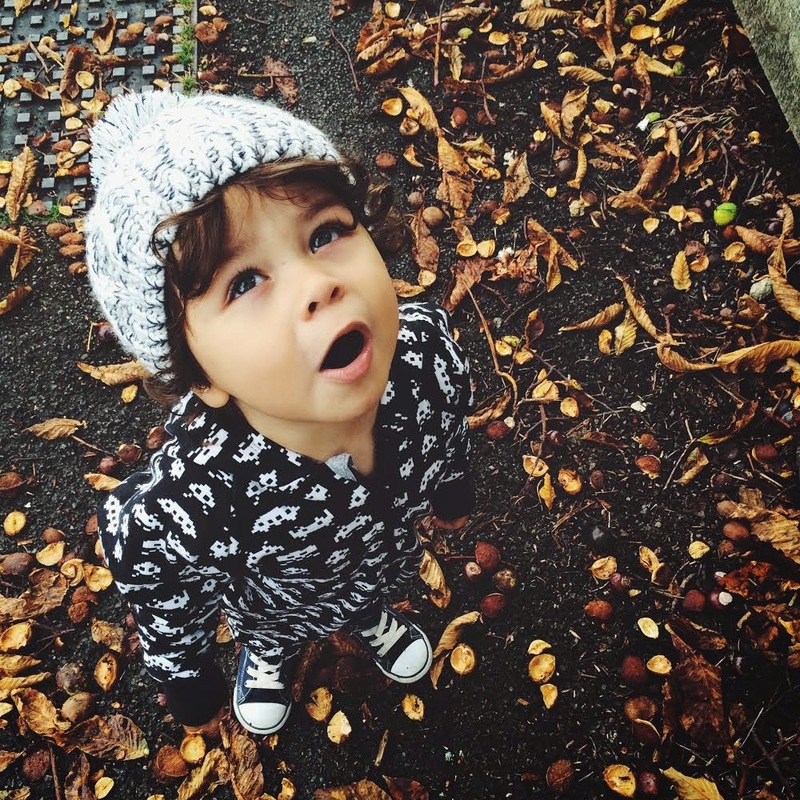 The Dandy Kid is a super cool and quirky independent store, who source stunning children clothing, accessories and toys from independent brands and designers from around the globe. You won't see much of it on the high street which I feel makes beautifully unique Christmas gifts. 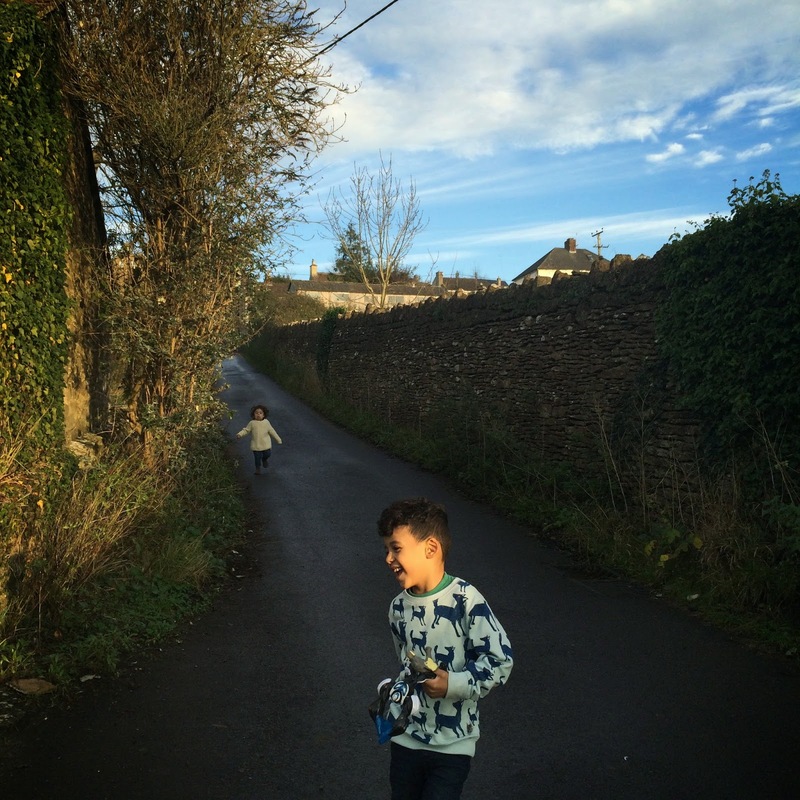 Because its Christmas Little Likely Lads have collaborated with The Dandy Kids to Give Away £50 to Spend at The Dandy Kid online store to buy whatever you like!! 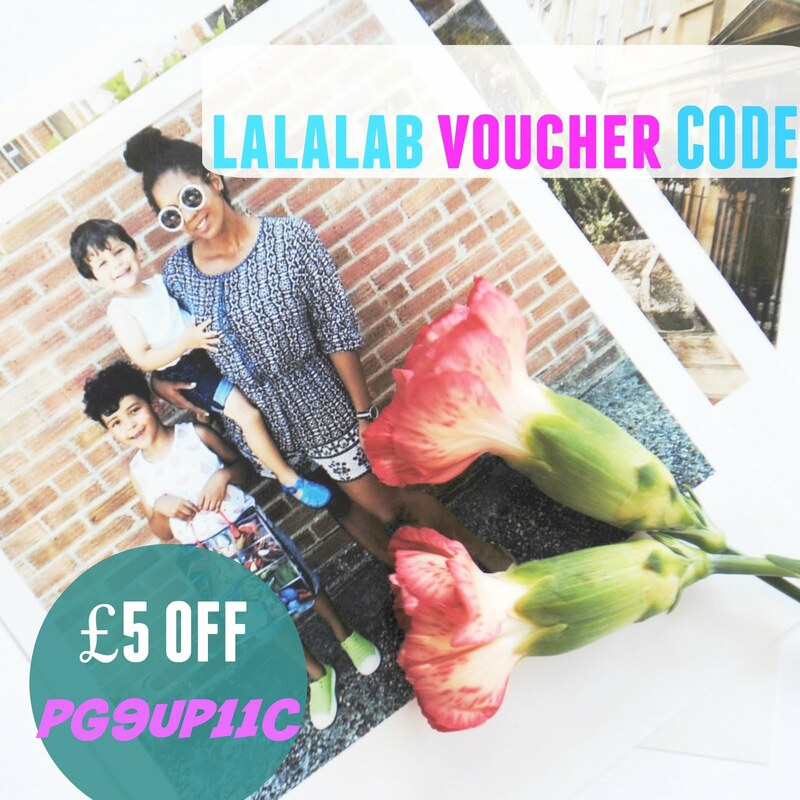 For a chance to win, in the comments below Tell me what you would spend the £50 if you were to win? and follow @littlelikelylad and @TheDandyKid on twitter! You can also have an additional three entries see Rafflecopter below. You are a UK and republic of Ireland resident. You have 28 days to acknowledge my notification, after which a new winner will be picked. You will receive your prize within 14 days of acknowledging your win. Your email address will be shared with The Dandy Kid and no other parties. I am always looking for ways to update my old jumpers. The jumper in the photo I love, I bought it last autumn and have worn it to death so its not my 'go to' when choosing what to wear, to be honest I'm a little bit bored of it, its turned into my 'lounge around the house' jumper. So I've decided to give it a new lease of life. If you are the same as me here are 3 Ways to Update your Tired Old Jumpers. Layer It - I recently bought a denim shirt to layer under my jumper and faux fur gilet but found that it makes me look all bulky and adds pounds on. I was beginning to think this look wasn't for me until I saw this post on Mama VIB, so I quickly hot footed it to River Island and purchased one for myself. The Denim collar shirt bib is a god send! I am wearing mine under everything! t-shirts, dresses and now jumpers. Instant fashion update without the bulk. Make a Statement of it - This is a simple one, add your biggest loudest statement necklace to instantly take your jumper from 'back of the wardrobe' to 'drinks out with friends'. Every time you change your statement necklace it's like wearing a new top. Try clashing the colour of your statement necklace with the jumper, trust me it looks fab!! Give them ago and let me know what you think. Is there anything you do to update old tired jumpers? Nativity 3, Dude Where's My Donkey?! 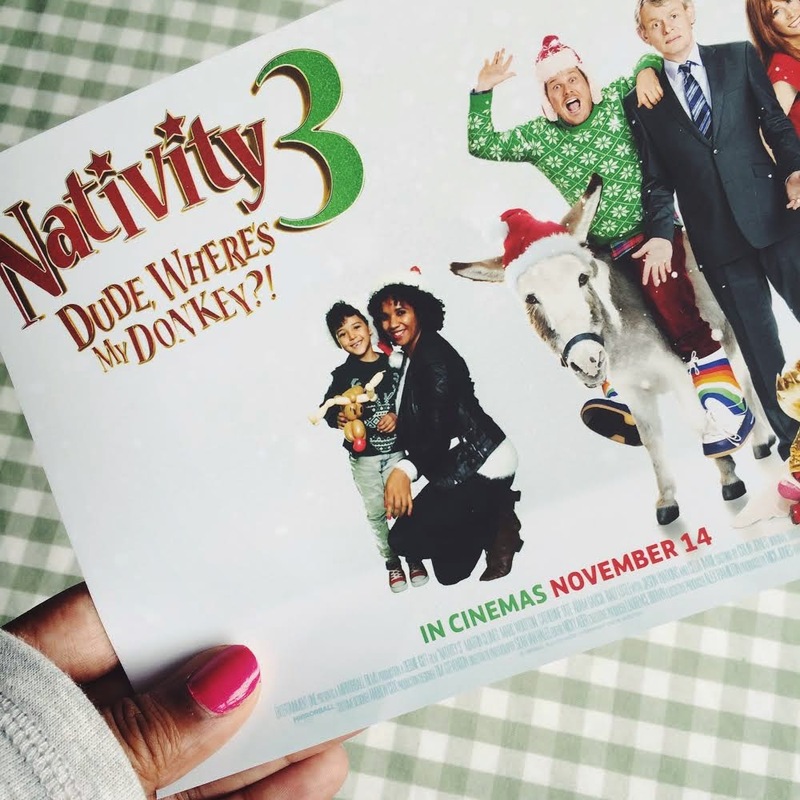 I was delighted to be invited to the Premier of Nativity 3, Dude where's my Donkey, for me as soon as Halloween is over I am happy to go straight into the Christmas spirit, I never feel like it's too early, I love the build up to the big day, so going to see Nativity 3 is perfect for me. Tiger is just as keen as I am to get the ball rolling on Christmas festivities and has already started putting together his Christmas wish list! I haven't taken Tiger to London for a really long while so thought it would be nice to leave Beaux at home with The Mister and make a day of it with just Tiger. We jumped on a train the morning of the premier and headed straight to Hamleys, Tiger was left jaw dropped at the FIVE huge floors dedicated just to toys, he was rushing around looking playing and mentally writing his Christmas wish list. Once Tiger managed to persuade a purchase from me, we went for a late lunch at Pizza Express, I feel ashamed to say it's been a while since Tiger has had my full undivided attention and it was lovely. After lunch I came away with a good understanding and appreciation of why Spider Man and Venom could never be friends! Interesting stuff! We then headed to see Nativity 3 wrapped up in our Christmas Jumper for the Save the Children Christmas Jumper 2014 campaign. The event was amazing it felt like we walked straight into Christmas, decorating reindeer shaped cookies, selfies with an elfie and Christmas themed balloon animals, it was great fun! We then eagerly found our seats to watch Nativity 3. We haven't seen Nativity 1 or 2 so I was unsure of what to expect. 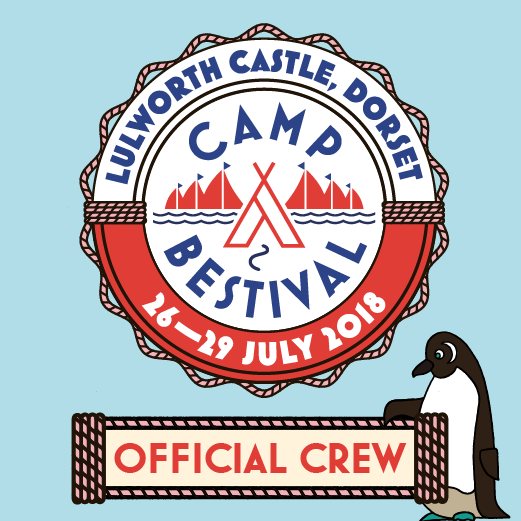 The film began with a quick look back at what happened in the previous films, although it wasn't needed as the film is very easy to follow and aimed at young children but with laughs thrown in for us adults. Lots of catchy songs throughout which I thought might lose Tiger but I looked over at him to see him happily bopping away to them. Nativity 3 had the feel good festive vibe you would hope for a Christmas film and Tiger chuckled all the way through. We both really enjoyed it, it was a lovely way to end our day. Nativity 3, Dude Where's my Donkey is a must to get you into the Christmas spirit. 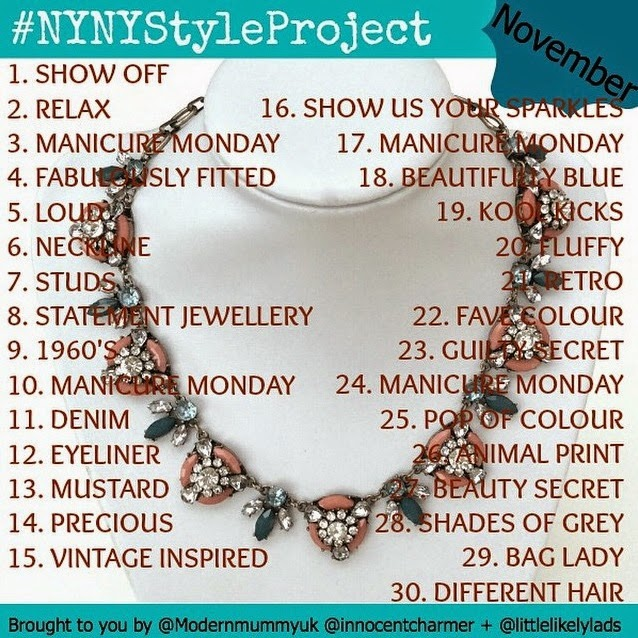 #NYNYStyleProject November Prompts + GiveAway!!! November already! October just flew by, I didn't manage to take part in many of the NYNYStyleProject (New Year New Style Project) last month, we had sickness bugs and colds on and off pretty much the entire month! I was mainly dressed in jeans and t-shirts which were swiped in kiddie snot (a mothers life is so glam!) 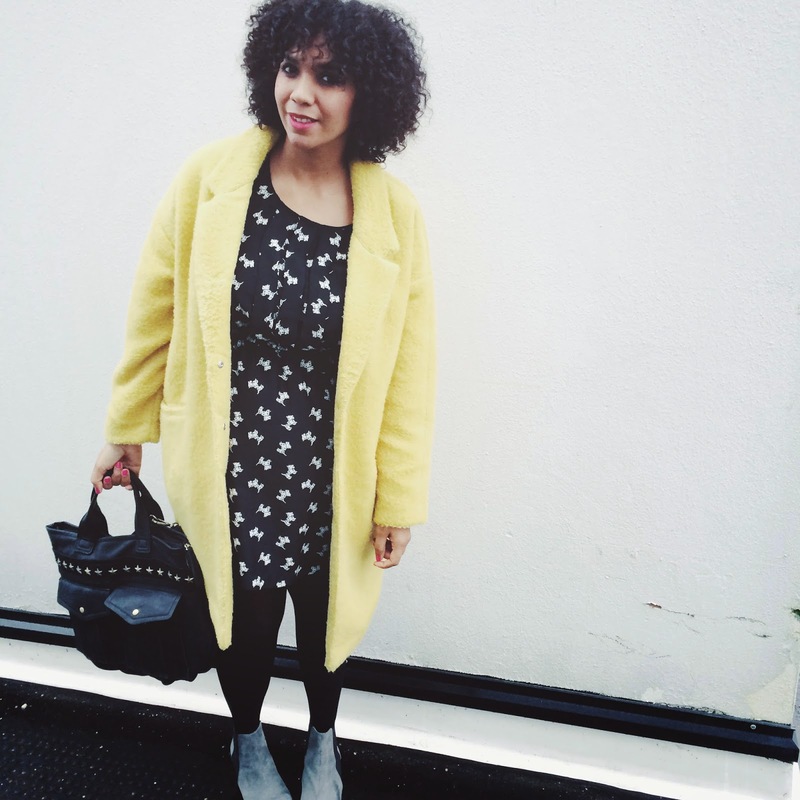 which I didn't feel was very #NYNYStyleProject chic! 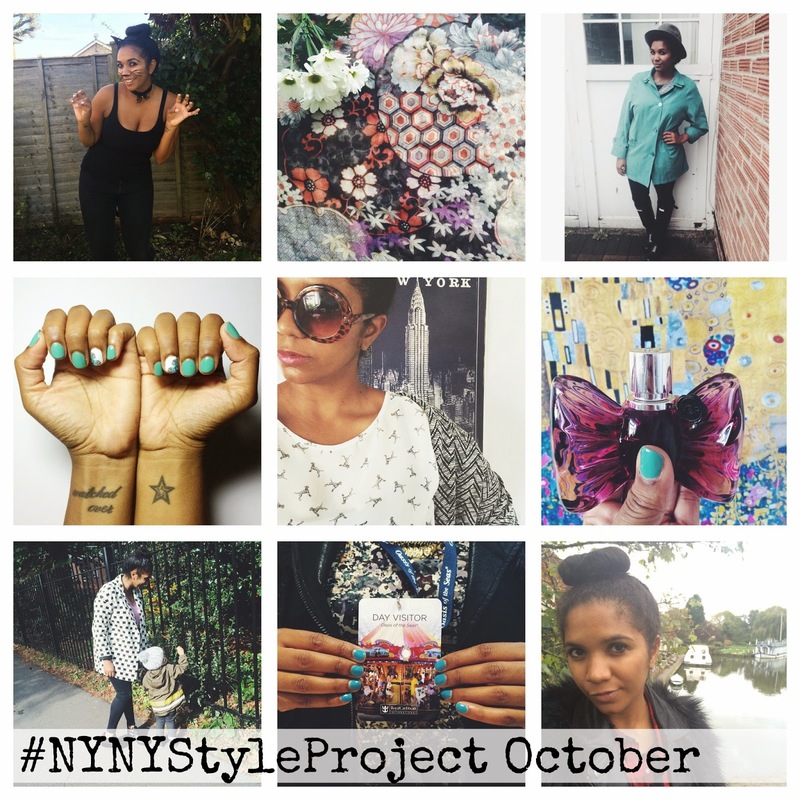 However the beauty of the NYNYStyleProject is that you can feel free to dip in and out as you please. Below are a few of my interpritation of the prompts I did follow in October. Unfortunately November has started off a bit similar and I feel like I need to give myself a little pick me up, the way I dress plays a huge part in the way I'm feeling about myself. The Mister knows this about me and treated me to a mega shopping spree at the weekend so I'm now kitted out in some lovely new autumn/winter pieces which I'm sure I will be showing off throughout November's NYNYStyleProject and surprise surprise my mood is feeling lifted! Funny what a new pretty pair of boots can do. Novembers NYNYStyleProject is rather special we are collaborating with Alice's Wonders and are hosting a giveaway of the below stunning Statement Necklace!! This statement necklace would look fab over a simple chunky knit. All you have to do for a chance to win this stunner is take part in the NYNYStyleProject every time you post a photo on Instagram or Twitter using the hashtag #nynystyleproject you will be entered into a draw, you must also follow @aliceswondersuk on Instagram. The Give Away ends on the 30.11.14 Good Luck! We love Halloween, the perfect excuse for me to dress the littlest lad in super cute Halloween costumes. Last year I dressed him in a cute pumpkin costume (it's an unwritten rule that all babies in our family dress as a pumpkin and have photo taken in a laundry basket!) this year he's a seriously spooky (not at all spooky) black cat. This black cat onesie was a bargain I found in the sales at H&M after Halloween for just a few pounds. 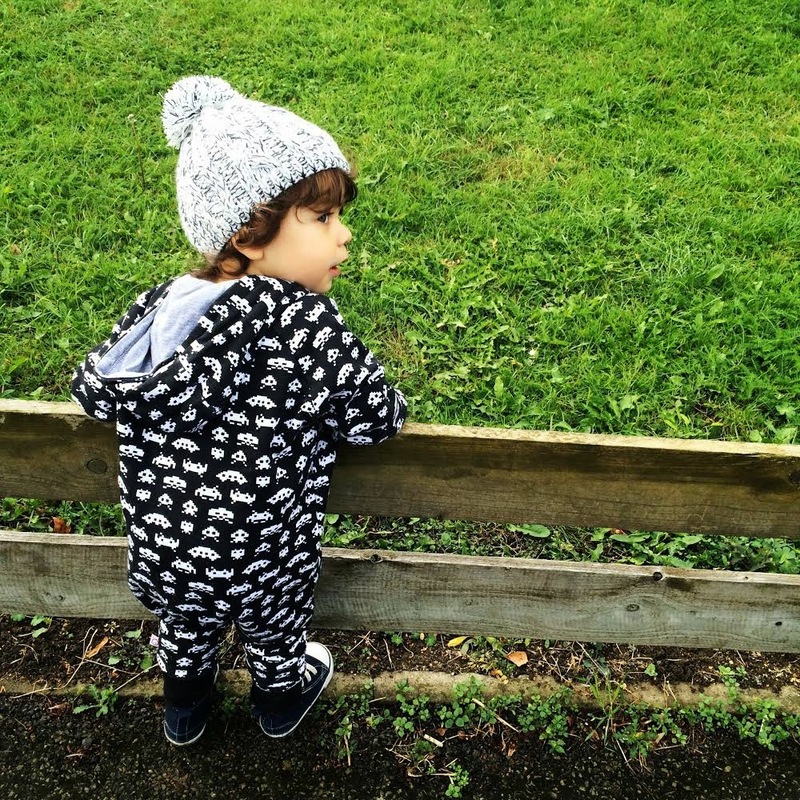 Beaux actually wears it all year round, its usually something I bundle him in after a swimming lesson or even for the school run on those days when I'm running really late, well its either that or his PJs! At least with the onesie I can get away with pretending its intentional. A black cat halloween costume is not hugely creative and maybe not massively inspiring but it's fuss free with minimal face paint and incredible adorable. Beaux love his cat onesie and runs around meowing (loudly!) it's all just far too cute! Halloween is Tigers favorite holiday and each year he goes to great lengths to decide what he wants to dress up as, this year his choice was a mummy 'a mummy with bloody bandages'. So I went on the hunt for a costume but I could only find cheap plastic ones which still cost a small fortune. So decided to knock one up myself, I jumped straight onto Pinterst and searched for DIY Mummy costumes and loads of amazing handmade high quality mummy costumes came up from which seemed to be made by super mummy's who were all dab hands at using a sewing machine or sewing by hand - errr these were not for me! My sewing skills stretch to sewing on a button and this could still take me a while, therefore I did not relish the thought of sewing on loads of bandages! and wrapping them around him didn't seem too 'wee friendly'. My mum the resourceful domestic goddess that she is thought of using iron on WonderWeb hemming tape instead. 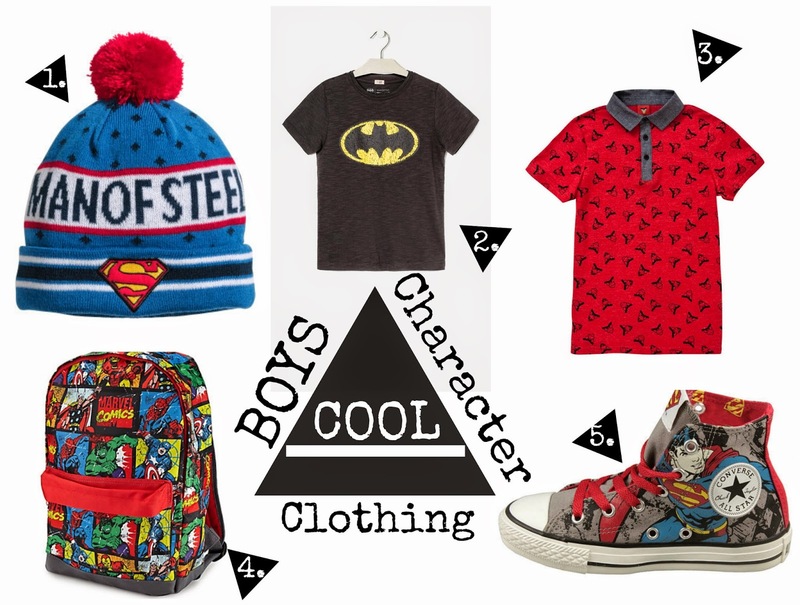 All this cost just £4.95 which is at least half the price of most childrens halloween costumes. I simply roughly cut the banadages and WonderWeb into stripes and roughly ironed them onto the t-shirt and leggings. I made sure it wasn't perfect as I wanted some stripes of banadages to be handing down to look like they had been unraveling. Remember to save a piece to tie around the head. Once I had covered most of the area I dabbed a wet tea bag to give the impression of an old aging mummy costume. I then dotted round some fake blood and that was it. It look me about 30 minutes to make and Tiger was so impressed with his 'mummy costume with blood stained bandages' he couldn't wait to try it on. On the day of the Halloween party we used a little white face paint and bit of guy liner (Tiger is not a huge fan of face painting) and sprayed a bit of white hair spray in his hair. I then tied the piece of blood stained bandage I saved from earlier around his head and chin to finish off the look and tah dah, the cutest, scariest, 'wee friendliest', DIY, no sew, mummy costume you will ever see. Banana loaves are my favorite way to use up over ripened bananas and I love experimenting with them. So far I have made a banana and walnut loaf, banana white chocolate and almond (that was delish but very sweet) but my all time favorite has to be banana and cherry loaf. I've got my recipe down to a tee, it's moist and has never gone that horrible 'purpley colour' that I've seen at some cake fairs and tastes amazing with a hot cup of tea. Preheat oven to 180C/160C Fan/Gas 4 and grease loaf tin with butter. I like to mash the bananas in a seperate bowl first and I prefer mine smooth with no lumps. Next add the bananas and Vanilla essence into the cake mix and stir. The cake mix should be smooth and fall from a spoon when held upside down. If it's too thick add a little milk. Spoon the cake mix into the greased loaf tin and stud with cherries for a more even spread. Pop into the oven and bake for approximately 25-30 minutes until golden brown and the skewer comes out clean. Leave the Banana and Cherry Loaf to cool in the loaf time for a few minutes then transfer to a wired rack. 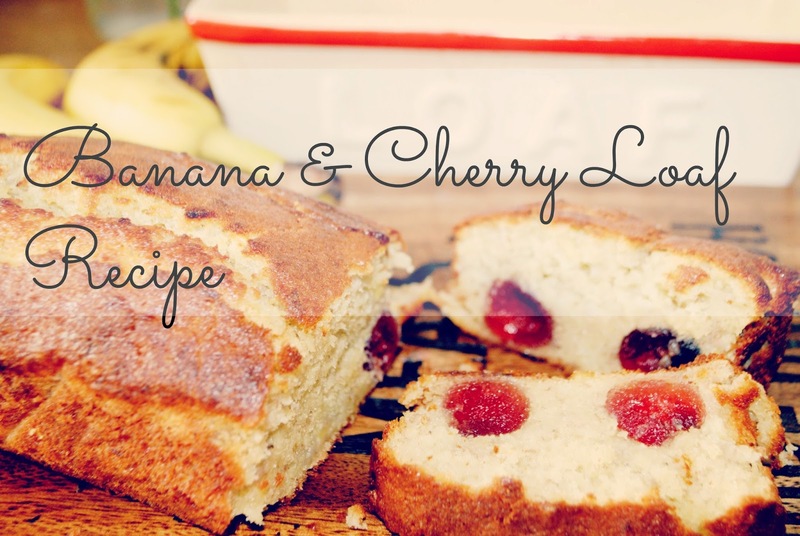 I personally like to serve my Banana and Cherry Loaf while still warm with a hot cup of tea. Yum! This is so lovely, warming and comforting on a chilly day. Last week I was lucky enough to be invited by Royal Caribbean Cruises to experience a day on-board the worlds larges cruise ship the Oasis of the Sea. 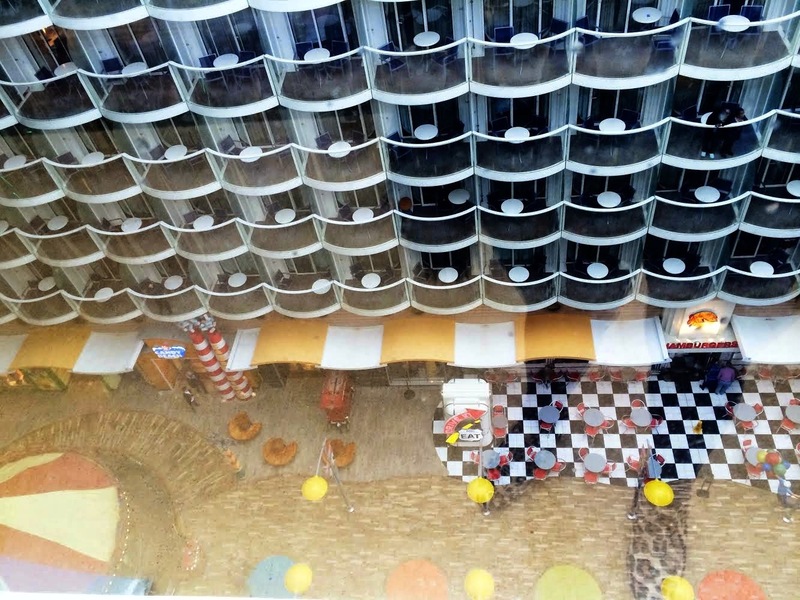 Cruising as a family isn't something we have considered, my initial thoughts of cruises was that it catered for older retired people and therefore not suitable for busy noisy young families. Would there be enough entertainment on-board for young children as well as myself and The Mister? So on my visit I scoped out what there really was to do. Entertainment for The Kids - Well it didn't take long to see that Royal Caribbean Cruises do cater for families. While we were having lunch we were visited by Alex the lion from Madagascar, if Beaux and Tiger had been with me they would have been besides themselves with excitement, what a welcome! In fact all of us mums were maybe a little too excited to see the characters and have our photos taken with them. After lunch we visited the Kids Club, first impressions was that it was bright, colourful, all very new and clean. I imagined Tiger excitedly heading straight to the kids very cool arcade and Beaux checking out what there was to climb on in the toddlers room or get stuck into creating a master piece. The Kids club on-board is separated into age appropriate rooms with activities to match. We were invited to have a mini science lesson, which is one of the many activities on offer at Kids Club, we were given a few ingredients to make an exploding volcano, Tiger would have gone crazy for this and we may even give this a go at home if I can take the mess! The staff (all fully trained teachers) who you can tell are excited, enthusiastic and love their job, told us they try to encourage all children to take part in the set activities which they change daily as well as having free time to chill out with a movie or play computer games. As well as indoor activities there is a splash world (H2O Zone) and shallow pool for those sunnier days. Entertainment for The Adults - When choosing a holiday for myself and The Mister good food and drinks, relaxation and activites is on the top of our 'must have' list. We 'ate out' at restaurants for both lunch and dinner on our day visit and the entire meal from starter to dessert was mouth wateringly A-mazing, such high quality! I would even go to say that the steak I had was 'THE' best I have ever tried. The portions were huge and I felt like I needed to be rolled out, I was happily filled to the brim! The waiters were always there, friendly and I felt like nothing was too much trouble. 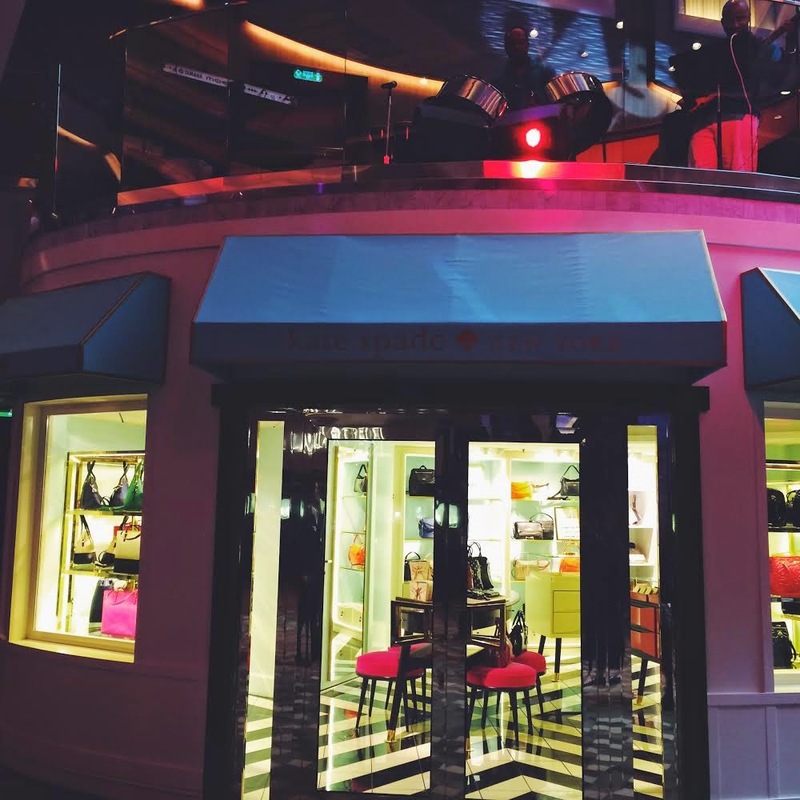 There were loads of trendy looking bars, my favorite being a bar which is located in the centre of the ship and goes up and down through each level like a huge glassed lift. I hear there is also a nightclub on-board but unfortunately we didn't get a chance to shake a tail feather there. For those of you who like to keep fit we were shown their on-board gym, there were lots of new equipment, my favorite was the treadmill which overlooked the sea. Although the gym looked pretty impressive I much prefer the Spa! We were treated to a hand and arm massage which was lovely my only complaint was it wasn't a full one (some people aye?!) Imagine a full body massage followed by a spot of shopping, my idea of heaven! Entertainment for Us All - There is so much to see and do, each level has a different look and feel with different activities on each of them. I think it would take a couple of days to look around it all and properly check out and see all the activities on offer. I'd imagine that with my family it would feel like each visit to a different level was a another mini day out. Without the hassle of packing kids into the car or the 'are we there yet's. On our day visit we watched a show, I was amazed a how professional the production was, it really was the standards of a west end show, I know Violet would particularly love watching a show like that with me. 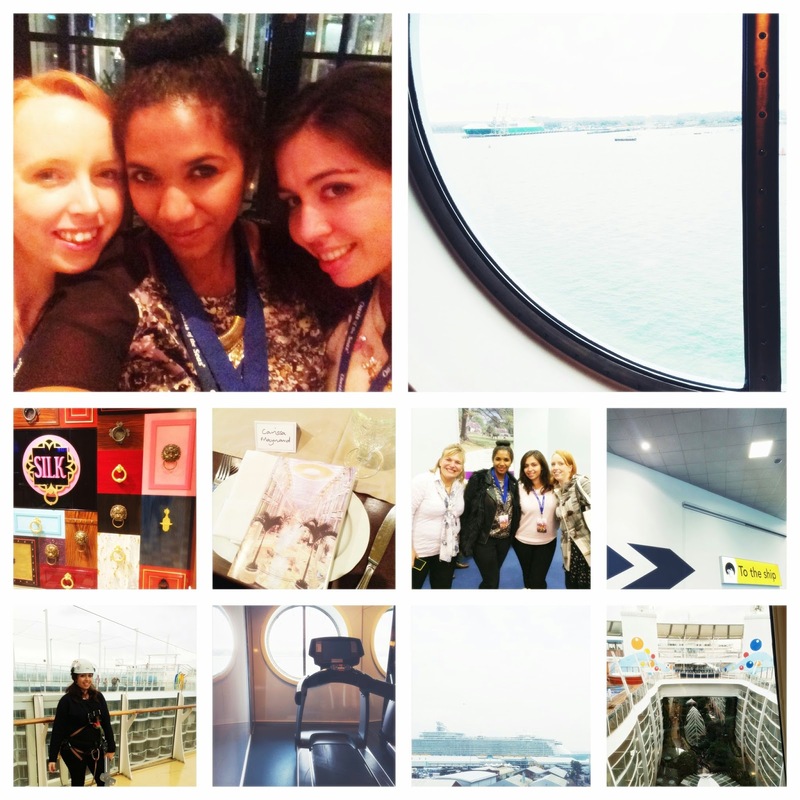 There was so much more I wanted to see - The ice rink, flow rider and of course a browse in their on-board shops! We were on-board the Oasis of the Sea all day and we didn't have time to see it all which I think in itself shows how massive the ship really is and how much variety of entertainment there is. 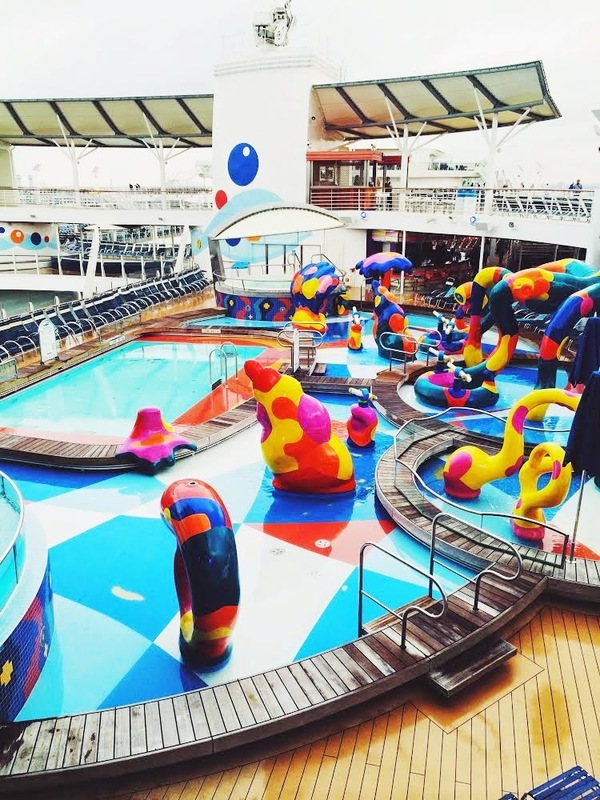 Having never considered a Royal Caribbean Cruise before its definitely something we will seriously discuss when choosing our next family holiday. Below - Rosie from Mummy & Boo braving it on the Zip Wire, I chickened out at the last minute! So I've been seeing that all the cool kids are wearing choker necklaces. This is a fashion I remember so clearly the first time around! Wow I feel so old right now. I have always loved statement jewellery even in 90's as a teen. I remember I had a collection of black and burgundy velvet chokers but my favorite were the black plastic stretchy ones which I thought were uber cool because they looked like you had a tattoo around your neck. I wore them with my hair scraped back into a low bun and side parting, black platform shoes, belly top and dark eye makeup (when my mum wasn't looking of course!) Actually the trend now doesn't seem all that dissimilar. I'm still not sure I will be rushing out to buy them this time around, the one in the photo is actually a stretchy headband and quite frankly a bit itchy and uncomfortable but I didn't want to dismiss this look before giving it my best shot. What do you think of choker necklaces, do you also remember them back in the 90's? 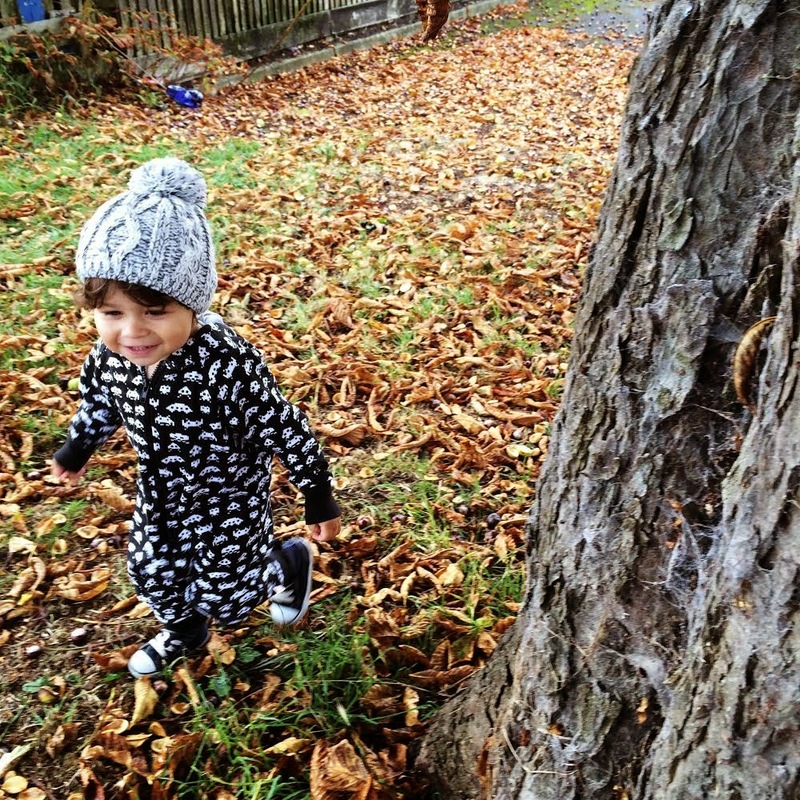 I'm a huge fan of Zulily for grabbing great deals on good quality clothing for both myself and the little lads, this is where I came across Oh Baby London. 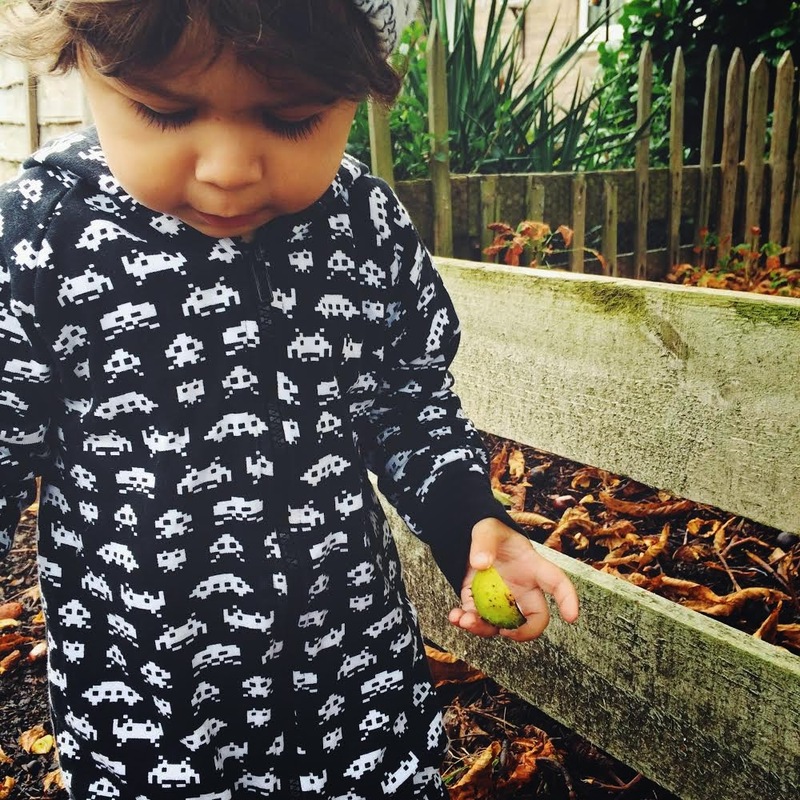 I'm a little ashamed to admit I have never heard of Oh Baby London before but was drawn to the super cool space invaders design so I bought it in a cute all in one for Beaux and drop crotch joggers for Tiger. Tigers joggers are a bit too big so he's yet to wear them, but Beaux has already worn his oh baby London all in one loads. I find all in ones great for when we've been lounging around the house then decide to pop out. They are a full outfit wrapped up into one super cute all in one (as it's name might suggest, sometimes I do like to state the obvious!) as it's still mild Beaux didn't need a coat just a little bobble hat and we were off to collect some 'con conks' (conkers to you and me).